At Christmas time in Germany, the air fills with the smell of almonds, marzipan, cinnamon, cloves, gingerbread, and freshly baked spiced cookies. Sift together the flour, baking soda, and baking powder - either in a large bowl or with the food processor - and set aside. Beat the butter and brown sugar together until creamed - the mixture is should be fluffy. Add in the ginger, cinnamon, cloves, salt, and pepper. Then mix in the eggs and molasses. Mixing constantly, add the sifted flour, gradually. Divide the dough in half. Wrap each half in plastic or foil and chill it in the refrigerator for at least one hour. Sprinkle flour on a clean surface. Roll dough to 1/8 of an inch (3-4 mm) thick. Cut out shapes with cookie cutters. Put the cookies on a baking sheet and refrigerate them for about 15 minutes. The dough will become firm, preventing cookies from spreading too much. Bake 8 to 10 minutes, or until crisp. Remove the cookies to a rack and allow them to cool. Cut star, bell, or Christmas tree shapes for Christmas; bunnies and egg shapes for Easter; hearts for Valentine's; maybe balloon shapes or squares to decorate as a wrapped present for a birthday. 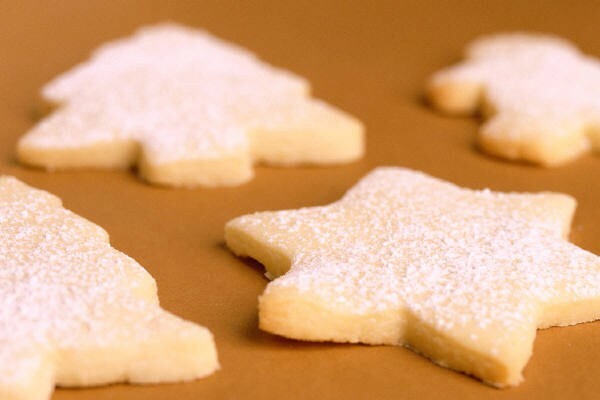 After the cookies cool, decorate them with icing and color sprinkles, or just sprinkle some icing sugar on top. A food processor makes dough in no time at all. Alternatively, use a hand blender and a large bowl to cream butter and sugar and mix the dough. Lebkuchen is the kind of flat German gingerbread that has been baked in Nuremberg since the 1300s. Zimtsterne are a type of cinnamon and ginger stars very popular in Germany at Christmas time. The German town of Lubeck has a very old tradition of making marzipan. Marzipan is an almond and sugar paste. It is very pliable and it can be colored so marzipan makers can shape it in all sorts of forms: animals, flowers, fruits, dolls, and more. Some are so good one cannot tell the difference between a real fruit and the marzipan one, too good to eat!